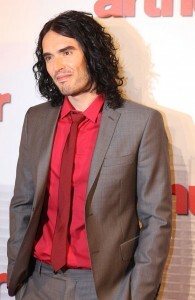 Russell Brand, star of “Get Him To the Greek”, will be signing copies of “The Pied Piper of Hamelin” and would love to see you there! Russell Edward Brand (born 4 June 1975) is an English comedian, actor, radio host, author, and activist. In 2004, Brand achieved notoriety as the host of Big Brother’s Big Mouth, a Big Brother spin-off. In 2007, he had his first major film role in St Trinian’s. In 2008, he had a major role in Forgetting Sarah Marshall; the film led to a starring role in Get Him to the Greek in 2010. He also worked as a voice actor in the animated films Despicable Me in 2010, Hop in 2011, and Despicable Me 2 in 2013. He played the title character of the 2011 film Arthur. With this first picture book in Russell Brand’s Trickster Tales series, the famed comedian, actor, and bestselling author delivers a hilarious retelling of an old fairytale favorite that will appeal to adults and children alike.